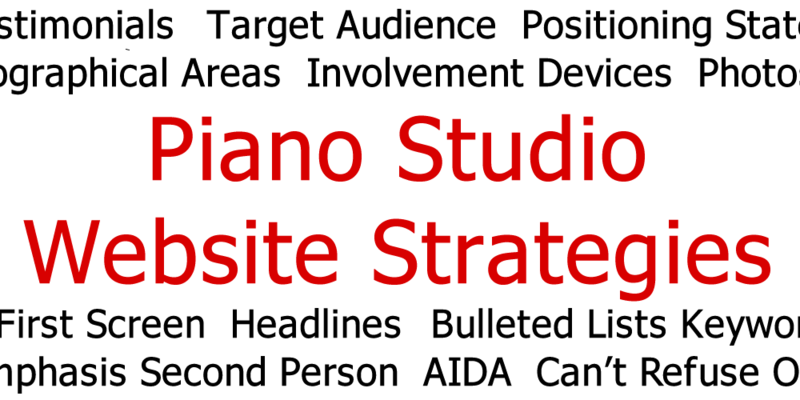 In Part 4 of this series I described Strategies #16 through #20 for creating a professional piano studio website. Today…<drumroll>…the last five strategies! 21. Would an Involvement Device Be Useful? Consider using an “involvement device” on your site, particularly on your home page. One easy involvement device is giving the reader a way to regularly stay in touch with you via Facebook or Twitter. A more elaborate device might be a Piano Lessons Wizard that asks a series of questions to help a prospective student decide whether they are truly ready for lessons or if they are a good match for your studio. 22. Is Your Copy Long Enough To Do the Job, And No Longer? When is the last time you read, word for word, an entire page of a website (let alone an entire website)? Uh-huh, I thought so. So edit, cut, and edit again until you say what you need to say in as few choice words as possible. 23. Do You Use Questions to Draw Readers In? What questions could you use to stimulate your readers’ interest? 24. Is Your Copy Conversational? You won’t break the bank with lessons at XYZ Piano Studio. 25. Are Your Spelling, Grammar and Punctuation Flawless? I often find myself at websites with spelling, grammar, or punctuation problems. Let’s face it: for any highly-educated professional like a piano teacher, this is embarrassing. I don’t know about you, but my opinion of a business will often fall in direct proportion to such errors. While this isn’t the case for every reader, your most educated readers will associate the excellence of your website with the excellence of your teaching. Don’t disappoint them.